Operation Theatre Technician, Medical Laboratory Technician, Dental Hygienist and Physiotherapist positions. As per requirement of HAL Hindustan Aeronautics Ltd, total positions are 74. Application mode is online. Opening date to submit of Online Application is 01-09-2018. Closing date to on-line registration process is 21.09.2018. Selection committee will conduct Written Test in October, 2018. 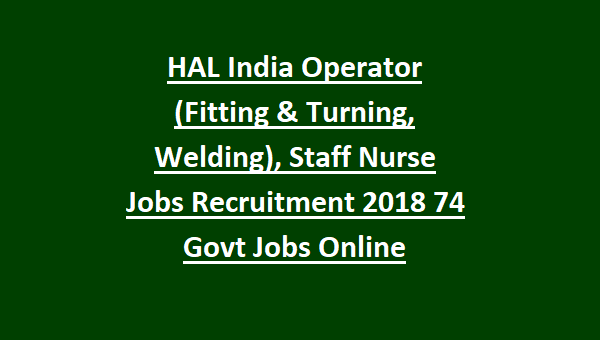 All details of HAL India Operator (Fitting & Turning, Welding), Staff Nurse, Pharmacist Jobs Recruitment 2018 74 Govt Jobs Online is mentioned below. As per requirement of HAL Hindustan Aeronautics Ltd, total positions are many. Qualification for Operator (Moulding & Fitting) posts is 10th passed and Direct three years NAC Certificate in relevant Trade. Qualification for remaining jobs is, 10+2 passed with Diploma in relevant discipline from a recognized Institution/University. Upper Age Limit should not exceed 28 years for Un-reserved category as on 21-09-2018. Upper age limit is relaxable up to 3 years for OBC candidates, 5 years for SC,ST; 10 years for PWD Candidates. Rs.16820/- per month for Physiotherapist posts; Rs.15,910/- per month for remaining posts. 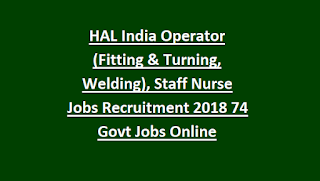 Selection Process for Pharmacist, Operator (Moulding & Fitting), Staff Nurse Jobs in HAL India Recruitment. 1. Selection Process will be through Written Test only. 2. Candidates will be shortlisted based on the marks/percentage obtained in the qualifying exam for relevant trade/discipline, would only eligible for Written Test. 3. Time duration for Written Test is two and half hours. It consists of 3 parts with Multiple Choice Questions. Part – I has questions on General Awareness (20 Questions for 20 marks). Part – II has questions on English and Reasoning (40 Questions for 40 marks). Part – III has 100 Questions for 100 marks on concerned discipline. There is no negative Marking. 4. Selection committee will conduct Written Test on October-2018. Candidates have to pay a non-refundable Application fee of Rs.200/- (Rupees Two Hundred only). Fee is exempted for SC / ST / PwD category candidates. Aspirants are required to apply online mode only through HAL India Official Website www.hal-india.com Closing date to on-line registration process is 21-09-2018. No other means or mode will be allowed.